The following is information for those registered to take part in the event for 2019. We offer two options for participants to obtain their Walk Card, required for stamping en route. 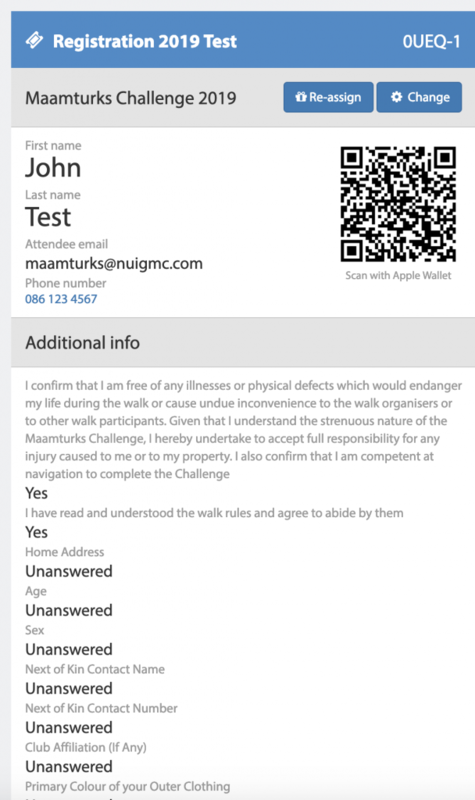 The Walk Card is stamped at all checkpoints by NUIG MC to track the progress of the participant on the Maamturks Challenge. There will be 2 lanes on the morning of the event – Express Registration and Morning Registration. We strongly encourage participants who live in the locality or arriving on Friday evening to avail of Express Registration, to register on the night before the Challenge. Walk cards will be issued at pre-registration along with a numbered token. You will need to leave your token at the start of the walk and the start will also act as the first punch on your walk card. This should greatly help with queueing times on the Saturday morning. Here you can enter your details. Be sure to hit ‘Save’ before leaving. That will complete the entering of your details. Check your promotions / clutter / non-focused inbox in case the emails are there. Send us an email to maamturks@nuigmc.com and we can check it for you. If you do not enter your details online, you will be delayed at pre-reg or on the morning of the event. If you have any issue using this system, please just email maamturks@nuigmc.com as soon as possible. Please do not wait until it is too late. An 80 seater bus will run from Leenane Hotel to the base of Corcóg on the Saturday morning, boarding at 04:00, departing at 04:20. Please have all your gear in order to prevent delays. This bus will start boarding from 4am and the departure will be scheduled for 4.20am from Leenane. Note that the bus will not depart from outside the hotel as per last year, but will depart from the car park on the right just as your arrive in Leenane from Maam to allow the bus to turn around. This is directly across the road from the Sheep and Wool Centre and is approximately 10 minutes walk from Leenane Hotel. There will be a shuttle bus back to the start from Leenane in the evening from 14:00 – departing from Hotel car park throughout the afternoon. The last run for the bus will be around 7pm. There is no charge for this bus. Roadside parking will be also be available at the starting point. Please park vehicles on the Lackavrea side of the road, soft gravel, opposite side to Corcóg. Our volunteers will direct you with parking in the morning. There will be a shuttle bus back to the start from Leenane in the evening from 14:00 – departing from Hotel car park throughout the afternoon. The last run for the bus will be around 7pm. There is no charge for this bus. 2019 marks the 20th Anniversary of the passing of Michael Crosbie, a volunteer from the Galway Radio Club who tragically passed away at the Maamturks Challenge in 1999. Michael was on the Leenane Hill checkpoint, who in appalling conditions remained on station until all walkers had been accounted for. On the descent that night he was fatally injured when he took a fall. He gave the ultimate sacrifice to ensure the safety of the walkers. Today all checkpoints must descend before darkness and the walk starts earlier in the day, but we still remember Michael and his commitment the participants of the Maamturks Challenge. We would like to ask all participants to remember Michael this year. Following the completion of the walk, we will have a gathering of volunteers and participants at the plaque dedicated to Michael in Leenane to observe a minute of silence. All will be welcome to attend. Anyone who ordered a t-shirt will be able to collect it at the Pre-reg on Friday evening or else in Leenane on Saturday. There may be a limited number of surplus t-shirts that will be available for sale for €10 in Leenane on Saturday. 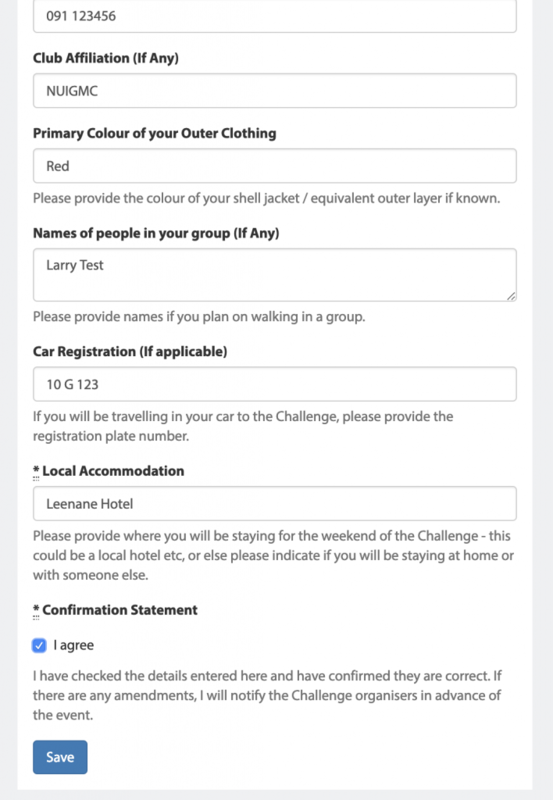 The cost of participating in the Maamturks Challenge is €30. This includes some warm refreshments at Finish 3 in Leenane at the end of the walk. Please carefully note the walk rules below, they are required for both the safety of participants and volunteers. Breaking rules may result in disqualification from the walk. The 2019 Maamturks Challenge will take place on Saturday 6th April. Check-in will be open from 05:00-07:00 (NB: Moved back from 6am start last year), or on the evening before the walk between 18:30 – 20:30 in Keane’s Bar at Maam. Walkers will be required to check in at all of the checkpoints along the route and have their Walk Cards punched. The cut-off points at Loch Mhám Ochóige and the Col of Despondency will be implemented at 14:00 and 17:00 respectively. Unfortunately participants who fail to make these cut-offs will be requested to make their way to the nearest designated exit point. 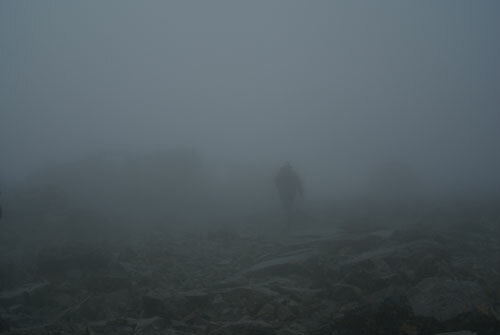 In the interest of safety, we require that all walkers should be properly equipped for a tough day’s hike with strong boots, waterproof jacket and pants, warm clothing, and sufficient food and drink for the day. All participants, irrespective of whether they are a part of a group are required to have their own map(s) and compass and be proficient in navigation. GPS is not to be considered a substitute. More details on this can be found on in our FAQ section.